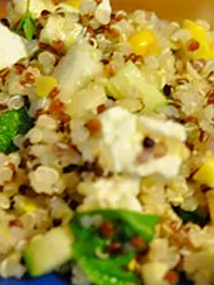 Quinoa is one of the most popular and nutritious seeds in the marketplace today. It is gluten-free, a good source of protein, iron, and fiber, and is quick and easy to cook. But, many of my clients complain that It has an unpleasant bitter taste that tainted everything they mixed it with. The good news – you can easily get rid of this bitter flavor and make a great-tasting quinoa by rinsing the uncooked quinoa under running water. This step is extremely important because it helps remove the bitter-tasting saponins naturally found in quinoa.